Fresh eyes on London: What am I? Had a wretched cold all week, consequently haven't been pounding the pavements of London for more glimpses for you. Instead you get a treat and competition from my visit to Kew Gardens. Pretty bird, but I have no idea what it is. Ok all you bird watchers tell me. What am I? Lucky you: I'm an expert in birds. So, let me see... a beak, covered with feathers,yes... definitely a bird. I'm afraid I can't name that bird but it is a beauty! I don't know too but it's gorgeous! Nice bird. I like the dappled shadows! I had never seen one of those. Funky bird. I like it! I don't know what bird it is. But I do know that it is beatiful. I've got absolutely no clue as to the species of this one, but it's a beautiful shot of a colorful bird. I'll tell you what you are... An extremely beautiful creature in an incredibly good shot! I'm sure of that. Great, Mo! By the way, terrible weather, cold and rainy, even down here in Italy! I'll just call him "box of crayons bird". ha ha. Thanks for the comments! I love my teeny garden too. It keeps me busy while i'm saving for my next big (or small) trip. Awesome bird, whatever it is! I love Monsal Varga's comment! Ha! Funny! Beauty! You've got a great eye! Of course I had no idea, but I checked on Google if PepeB is right. She obviously is!! Some kind of partridge?! Great photo of this colourful bird. My expat English hubby identified it as a Golden Pheasant also. We have Pheasants here in our local bush in Brisbane but not those beautiful ones. Love looking at your blog as my daughter lives in London. I had it half-right...I knew it was a pheasant, but no idea what kind. We have ring-necked all over our valley here. They are indeed quite beautiful creatures. What a beautiful creature. Thank you for posting this! He's a stunner. You're turning into a wildlife photographer. I hate a cold just horrible. "Pretty Birdie"!? Three or four different birds stuck together?! The kind of thing that would make me stop and my jaw drop open if I saw it in the wild!? For sure. yes, it is a golden pheasant, I had that once when I was in Shanghai! it was very nice! 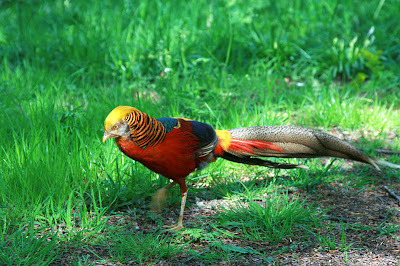 Yup- a golden pheasant, common in China. Kew is loaded with them.